In just over 4 hours today I tore down the bike, replaced the motor, cleaned the carbs, flushed the oil, lubed the cables, cleaned the throttle, adjusted the brakes and inflated the tires. The replacement motor starts easy and runs well. I can’t wait for the morning so I can go ripping around. 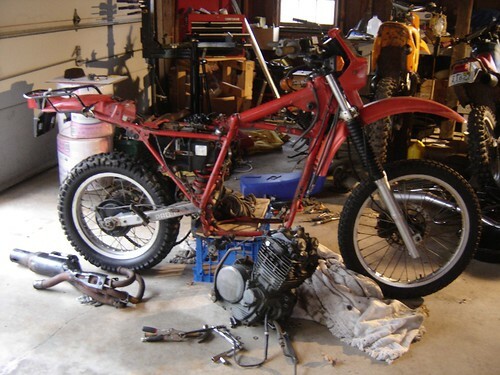 You can install a XR650L motor. But you’ll also need to find places for the additional electronics and battery, which will mean making a custom airbox and welding in mounts. There are those who have machined custom cases for the motor to accept an electric starter, but that’s a one off job and VERY time consuming. You’ll be best off if you just learn to love the kickstarter. If you can’t start it in 1 or 2 kicks then the bike is not tuned properly, or you are not kicking properly. Did you have to modify and mounts to drop the XRR engine into the XLR frame? Did you use like years for bike and engine? Did you use the XR or the XL headpipe. The reason I ask, I have an ’83 XL600R with a basket-case engine and a built ’93 XR600R engine without a home. Thanks in advance for your response.